Tamale, Dec. 23, GNA - The Commanding Officer (CO) of the Sixth Battalion of Infantry, Lt. Col William Omane-Agyekum said on Wednesday that Dagbon was full of illegal arms. He said this was why the people fired gunshots indiscriminately and disturbed the peace at the least provocation. Lt. Col. Omane-Agyekum was speaking at this year's West Africa Soldiers Social Activity (WASSA) celebration of the unit in Tamale. The occasion offers the soldiers the opportunity to socialise, review their performance and make projections into the future. Lt. Col Omane-Agyekum said it was no secrete that Tamale and its surrounding villages as well as the rest of Dagbon was full of illegal arms even though the area was supposed to be a weapon-free zone. He said a search by the security agencies for arms had yielded positive results but noted that this was not enough to guarantee the safety of the people. 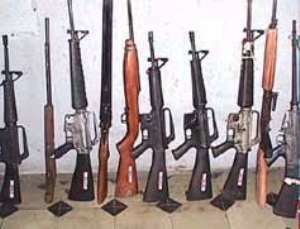 The CO said: "If we are to have peace in Dagbon then we must seize these weapons and arrest all those possessing them." He commended his unit and other security agencies for maintaining peace and helping to ensure a peaceful election in the area. "Had it not been for your alertness and quick reaction to situations the post election violence that erupted in Tamale and other parts of Dagbon would have been difficult to contain," he said. Col. Omane Agyekum urged the security agencies to assist civil authorities to maintain peace, law and order in the region in the coming year, saying' "we must not rest on our oars but be alert and vigilant at all times." He said at the beginning of the year there were a lot of armed robberies especially on expatriates in the Tamale Metropolis and on the highways but noted that these had been stemmed through the efforts of the security agencies. Mr. Ernest Debrah, Northern Regional Minister, who was the Guest of Honour, commended the security agencies in the Region for working tirelessly to bring peace, law and order to Dagbon. He urged them to ensure that there was absolute peace in the country to enhance development and progress.